Well everyone, the wait for our Missoula fly fishing season this summer is finally coming to an end. The rivers are still really big, but they are on the drop for good this time. Green drakes have started to emerge on the main Bitterroot, golden stones are cruising around on the West Fork, salmon flies are being eaten by hungry trout on Rock Creek, and the Clark Fork has finally dropped to a level where we can all pile in to the “Double Tree Hole” again (a.k.a. “The Hollywood Hole”). It all started this past weekend, and it was the first time in months that we actually got to see trout rise. Just to clarify, we’re not talking about random unexplainable rises here. We’re talking about good sized fish lining up on seams, and consistently eating bugs. So much in fact, that you don’t even need to work that hard at your fly choice. They will pretty much eat anything as long as it’s the right size, and it’s truly liberating. Before you get too excited, there is a catch. The main channels of the rivers are still obviously too big to wade for safe Missoula fly fishing, so it’s pretty much crucial to find a side channel if you‘re on foot. Luckily, the rivers are big enough that you don’t have to search very long to find one. Another slight problem is that the hatches are still inconsistent. Some days the bugs are everywhere, and other days they are nowhere to be found. The best way to get around both of these problems is to fish a lot (which is hard to complain about), and to try some new spots. We’re talking about good sized fish liningup! If you can only get out on the weekends, don’t worry. You can pretty much fish anywhere along Rock Creek and catch some fish off of the banks. We can‘t promise the best dry fly fishing of your life, but you should be able to catch enough to hold you over for a bit. Most important, you will be casting a fly rod on a Missoula fly fishing river again which is a pretty sweet concept that we are no longer forced to just daydream about. The time for complaining about high water has come and gone. It’s time to dust off your fly rods, and get out there! Side Note: I had a momentary lapse in brain power at Bell Crossing last weekend and left my best rod and reel laying on the ground. When I went back the next day, it was already gone. It’s a Winston BIIX 9’ 6 wt. with a green Ross Evolution reel on it. I know it’s a long shot, but it would be amazing if I could somehow get my fly rod back. If you know anything, or if you were lucky enough to find it, please let me know by leaving a comment below. Thanks everybody — and best of luck as you get out on area streams and rivers to once again enjoy the best of Missoula fly fishing. ——- Enjoy this blog? Please leave comments in the Facebook commenting box below and be sure to click the +1 button. Be sure to visit our Make it Missoula fishing page. And Check out Matt and Bryce’s other blogs: Missouri River Fishing–Trout Mecca of Montana and Fly Fishing Season is When? If you enjoy western Montana lakes and rivers, you might also enjoy our page on Missoula kayaking and rafting. 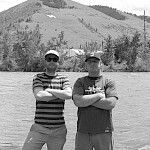 Bryce McLean: (Right) I was born and raised in Montana, and have been fly fishing here for almost 20 years. I first learned to fish on the Missouri River, but when I was 10 my family moved to the Bitterroot Valley. I have been fishing the Bitterroot River ever since. This will be my second season guiding the Missoula area rivers, which I consider to be some of the best trout fisheries on planet earth. Matt Devlin: (Left) Matt is originally from Annapolis, Maryland and learned to fool trout on the technical waters of the Gunpowder River. He has fished in Maryland, West Virginia, Pennsylvania, New York, Vermont, Main,e, Michigan, Indiana, North and South Carolina, Florida, Texas, New Mexico, Colorado, Washington, Idaho and Montana. He thinks about flies and fishing a whole lot.